The oil palm is the world's most valuable oil crop. Its production has increased over the decades, reaching 56 million tons in 2013, and it gives the highest yields per hectare of all oil crops. Remarkably, oil palm has remained profitable through periods of low prices. Demand for palm oil is also expanding, with the edible demand now complemented by added demand from biodiesel producers. The Oil Palm is the definitive reference work on this important crop. This fifth edition features new topics - including the conversion of palm oil to biodiesel, and discussions about the impacts of palm oil production on the environment and effects of climate change  alongside comprehensively revised chapters, with updated references throughout. The Oil Palm, Fifth Edition will be useful to researchers, plantation and mill managers who wish to understand the science underlying recommended practices. 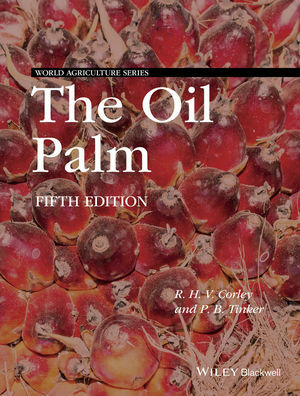 It is an indispensable reference for agriculture students and all those working in the oil palm industry worldwide. Professor B Tinker was for 7 years at the West African Institute for Oil Palm Research, and has been a consultant in Malaysia. For 12 years he was on the Programme Advisory Committee of PORIM (now MPOB). In the UK he has been Professor of Agricultural Botany, Deputy Director and head of soils at Rothamsted Experimental Station, and Director of Science at the National Environment Research Council.